on may 13th we are proud to host "the duell"
In this spectacular first time ever happening competition some of the most successful sport athletes in Switzerland are competing in different disciplines against each other. 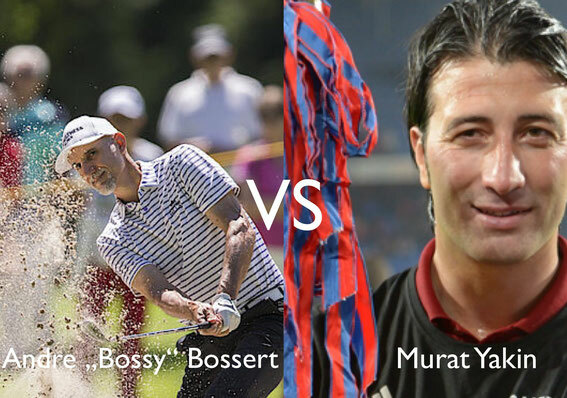 The most successful Swiss Golfer of all time Andre "Bossy" Bossert is competing in this exiting match against the Swiss Football legend Murat Yakin and other athletes like Olympic starter Fabienne "Fabsi" in-Albon, Marco Iten (the first Swiss Golfer overtaking Tiger Woods in the world ranking) and also different big names from the Disc golf scene. The first 6 holes every athlete is competing in his or her own discipline, followed by 6 holes in his or her choice of one of the other disciplines. We are very curious and looking forward who will win this competition in the disciplines Golf, Foot Golf and Disc Golf and can call him or herself "King or Queen of the Short Game World"
Come along and enjoy this competition on May 13th at 14.00 o'clock.